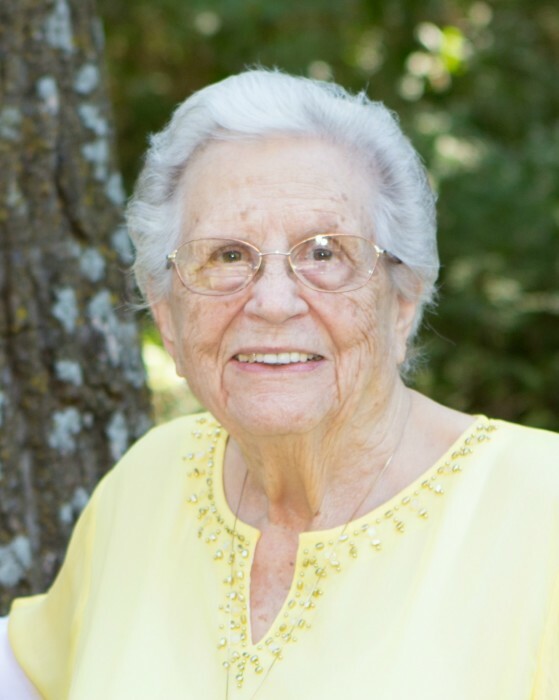 Obituary for Juanita Ruth Parr | Lanman Funeral Home, Inc.
Juanita (Nita) Ruth Houghtelin was born December 7, 1927, in Chatfield, Minnesota, to Art and Winifred Houghtelin and died in Enid on Tuesday, April 10, 2018 at the age of 90 years. She was the second of seven children. In 1939, Juanita came to live with her grandparents, Cliff and Nelle McDonnel, in Manchester, Oklahoma. She attended eighth grade at Rosedale School. She spent three years at Amorita High School, graduating in 1945. Juanita attended Northwestern State College, Alva, obtaining a War Emergency Teaching Certificate. She taught at Rosedale for a year and at Victory for a year. Both schools were one-room schools which then consolidated with Amorita Schools. Juanita married Howard Parr August 11, 1947, at First Baptist Church, Cherokee. They were married for 61 happy, eventful years. After his death, she continued to focus on family, taking a family trip to Boston to investigate her heritage, and hosting children and grandchildren on “The Farm,” a treat for her and for them. At 89 she tackled remodeling the living room on the farm. Juanita also served on the board of Alfalfa County Historical Museum and as a judge for the Alfalfa County Election Board, Amorita Precinct. She was an officer for the Amorita High School Alumni Association. Nita would do almost any community job she was asked to do. Juanita was preceded in death by husband, Howard, daughter, Carolyn Hoadley, her two sisters and four brothers. She is survived by sons, Bob Parr and wife, Connie of Nash and Harold Parr and wife, Suzy of Oklahoma City; son-in-law, Ken Hoadley of Flint, Michigan and daughter, Janette Payne and husband, Bobby of Kearney, Nebraska; grandchildren, Abby Fleming and husband, Aaron of Conway, Arkansas, Eric Parr and wife, Tina of Blanchard, Cliff Phillips of Fairview, Travis Parr of Wilmette, Illinois, Tyler Parr and wife, Michelle of Kansas City, Missouri, Steph Rasmussen and husband, Spencer of Las Vegas, Nevada, Greg Payne and wife, Brande of Lincoln, Nebraska and Kimberly Anderson and husband, Nathaniel of Lincoln, Nebraska; great grandchildren, Collin, Cale, Camryn, Callen, Coleen (Coco), Amorita, Reed, Korben, Charlotte (Lola), Kyle and Harper. Funeral service will be Saturday, April 14, 2018 at 2:00 p.m. at Cherokee First Baptist Church. Burial will follow at Byron-Amorita Cemetery with arrangements by Lanman Funeral Home, Inc. of Cherokee. Viewing will be Friday from 10:00 a.m. until 7:00 p.m. with family present from 5:00 until 7:00. www.lanmanmemorials.com Facebook: Lanman Funeral Home Inc.
Memorials may be made to Stamp out Starvation (stampoutstarvation.com) directly or through the funeral home.